Fig. 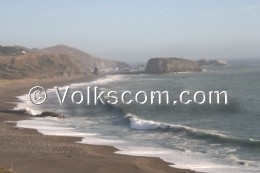 : Driving to the Northern Californian Beaches with a Ford Mustang. 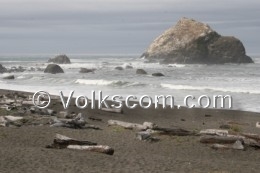 This beach is located at the so called Pebble Beach Drive at the northern Californian city of Crescent City. No parking fee is charged at this beach (as at: September 2009). Restrooms are not provided at the Pebble Beach Drive. 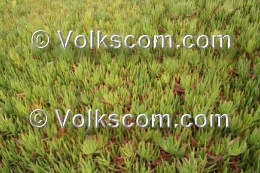 The Pebble Beach is on the lelft hand side at the Pebble Beach Drive (approach from the south) sehen. A lot of washed up wood is lying in the sand of the Pebble Beach. No parking fee is charged (as at: September 2009). Restrooms are not provided at the Pebble Beach. The Crescent Beach is located south of the city of Crescent City. 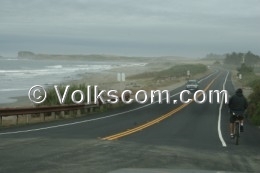 The wide sandy beach at the Crescent Beach is located next to the US Route 101 (Highway 101). The location isn’t very pretty. wood is lying in the sand of the beach. No parking fee is charged along the roadside (as at: September 2009). No restrooms are provided at the Crescent Beach. Conservation areas like the Redwood National Park are located along the US 101 (Highway 101). No entrance fee is charged at these conservation areas (as at: September 2009). No entrance fee resp. 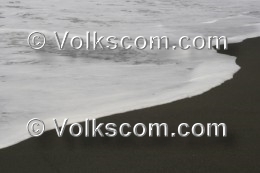 parking fee is charged at the two beaches, that are situated in this area. Restrooms are provided at the various conservation areas. Wilson Creek Beach - The Wilson Creek Beach is located next to the road and near the Lagoon Creek Beach. Trash, wood and remains of campfires are lying in the sand of the beach. At the time of the visit, there was a smell like restrooms (in some areas near the parking lot). No parking fee is charged at the Wilson Creek Beach (as at: September 2009). No restrooms are provided at the Wilson Creek Beach. Lagoon Creek Beach - The Lagoon Creek Beach is located close to the Wilson Creek Beach. A lot of washed up wood is lying in the sand. There are also remains of campfires. No parking fee is charged at the Lagoon Creek Beach (as at: September 2009). No restrooms are provided at the Lagoon Creek Beach. The Westport Union Landing State Park is named after the two settlements Westport and Union Landing. A small parking lot is located above the small bay with the sandy beach. 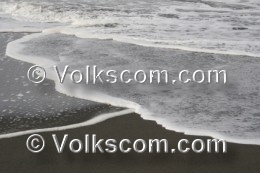 Rocks are situated in the water of the pacific ocean and in the sand. At the Westport Union Landing State Park there are restrooms and a campground. A parking fee resp. an entrance fee is charged at the Westport Union Landing State Beach (as at: September 2009). Caspar Beach is located at the road that leads from the California State Route 1 (Pacific Coast Highway / Highway 1) to the Point Cabrillo Light Station / Lighthouse. Caspar Beach is situated at the roadside of this road. Free parking space is available at the rough roadside at the Caspar Beach (as at: September 2009). No restrooms are provided at the Caspar Beach. 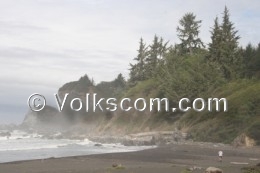 A small sandy beach is located at the Russian Gulch State Park. The beach is situated at a small bay. 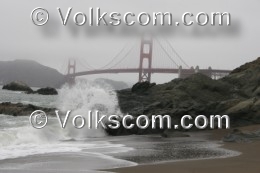 The bridge of the California State Route 1 (Pacific Coast Highway / Highway 1) is build right over the sandy beach. 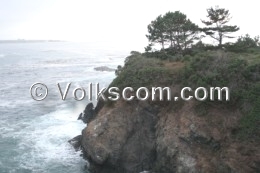 At the Russian Gulch State Park there is also a 36 foot (10 meters) high waterfall, a “blowhole” with ocean water, hiking trails, bikeways and a campground. The entrance fee resp. 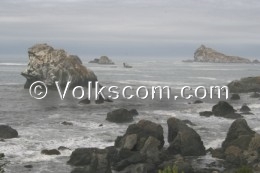 the parking fee is $8.- at the Russian Gulch State Park as at: September 2009). Restrooms are provided at the Russian Gulch State Park. 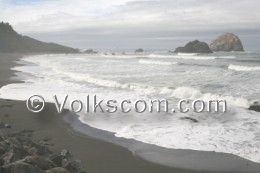 A wide sandy beach is located at the Mendocino Headlands State Park. A part of the beach is situated at the Big River. This is the Big River Beach. The name Big River comes from the redwood trees that used to grow here. 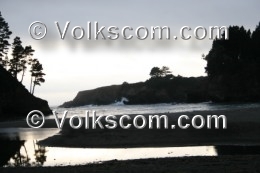 No entrance fee is charged at the Mendocino Headlands State Park (as at: October 2009). 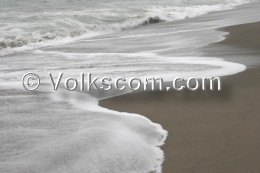 A grey sandy beach located at a bay is situated in the Van Damne State Park. 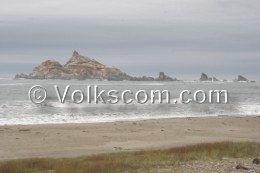 This beach is located next to the State Route 1 (Coast Highway / Highway 1). A campground and restrooms are provided at the Van Damne State Park. Internet access via Wireless Wi-Fi is available near the Visitor Center. The entrance fee resp. the parking fee is $8.- at the Van Damne State Park (as at: September 2009). 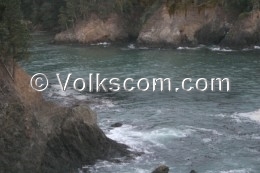 South of the historic Fort Ross, there is the Fort Ross Cove. 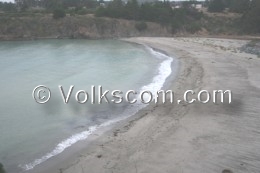 The Fort Ross Cove is a small bay with a small sandy beach. The entrance fee resp. the parking fee is $8.- at the Fort Ross State Historic Park (as at: September 2009). Restrooms are provided at the Ross State Historic Park. 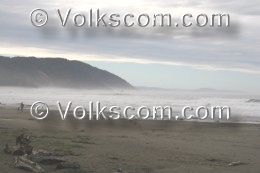 Jenner Beach is a wide sandy beach. The waves are rather big at the Jenner Beach in northern California. 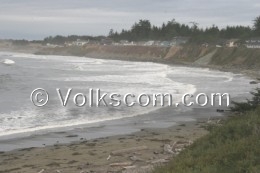 Jenner Beach is located north of the city of Jenner. A short trail leads from the parking lot at the California State Route 1 (Pacific Coast Highway / Highway 1) to the scenic beach. No restrooms are provided at the Jenner Beach. 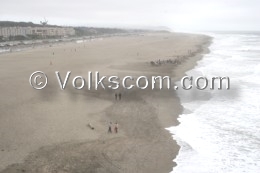 No entrance fee and no parking fee is charged at the Jenner Beach (as at: September 2009). The North Salmon Creek Beachis located at the upper left part of the picture. 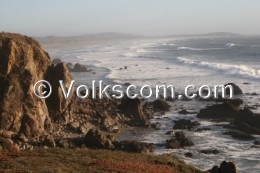 North Salmon Creek Beach is situated north of the city of Bodega Bay. Bodega Bay is well known as moviesite for Alfred Hitchcocks movie “The Birds”. 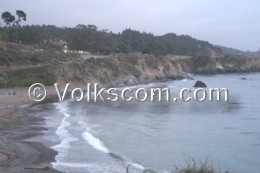 The parking lot is located next to the California State Route 1 (Pacific Coast Highway / Highway 1). 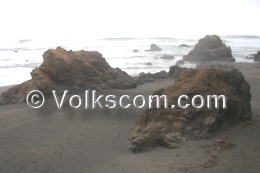 A short trail leads to the wide sandy beach of the North Salmon Creek Beach. No restrooms are provided at this beach. 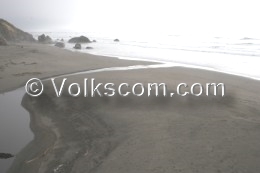 No parking fee and no entrance fee is charged at the North Salmon Creek Beach (as at: September 2009). 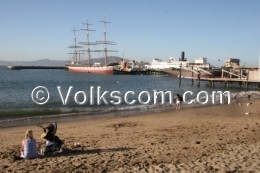 At the western end of Fishermans Wharf is the Aquatic Park and a sandy beach. Because of the cold water in the bay of San Francisco, swimmers usually wear a wetsuit. Restrooms are provided at the Atlantic Park Beach. 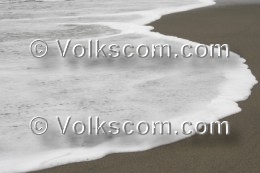 No entrance fee is charged at this beach (as at: September 2009). 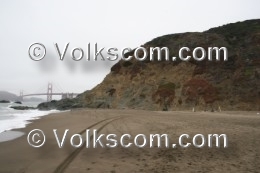 Baker Beach is located at the western coast (at the pacific) of the city of Stadt San Francisco. The picturesque view of the Golden Gate Bridge is famous around the world. Restrooms are provided at the Baker Beach. The Baker Beach shouldn’t be used for swimming. Swimming is dangerous at this beach. Warning sighs inform that swimmers have been drown at the Baker Beach in San Francisco. No parking fee and no entrance fee is charged at the Esplanade Beach (as at: September 2009). 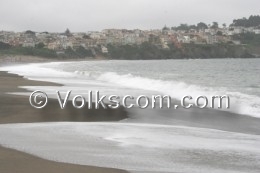 The Esplanade Beach is situated west of the Golden Gate Park in San Francisco. The Esplanade Beach is a wide grey sandy beach. The Esplanade Beach shouldn’t be used for swimming. Swimming is dangerous at this beach. Warning sighs inform that swimmers have been drown at the Esplanade Beach in San Francisco. No parking fee and no entrance fee is charged at the Esplanade Beach (as at: September 2009).